Sea ice off Nain, Labrador/Nunatsiavut in May 2011. Photo Astrid Ogilvie. 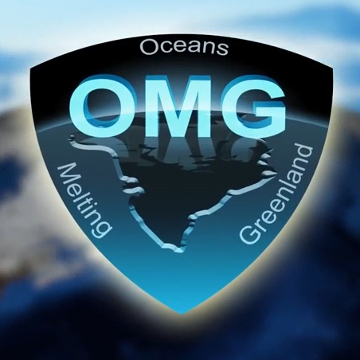 The North Atlantic Arctic is an important and complex natural system. 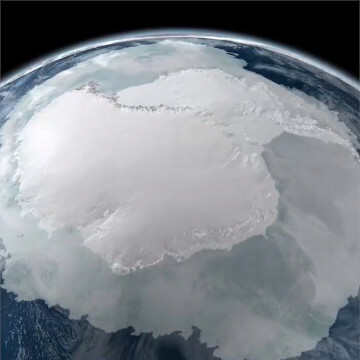 Understanding past and present sea ice–ocean–climate variability – and anticipating future changes – has potentially far-reaching implications for ecosystems and socio-economics and is critical to decision-makers within governmental bodies, as well as to public understanding. It is important to further understanding of both human-induced and natural variations, their drivers and interactions, in order to fully appreciate climate science information. One way of documenting past climate variability, and thus providing a context for present and future changes, is by studying records that illuminate past climatic regimes. Iceland, for example, has many, many narratives relating to sea ice which, particularly in the past, reached its shores on the East Greenland Current. These range from scientific writings to literary narratives and poetry. In one way or another, all describe ice as a bringer of hunger and desperate times. It has been said that sea ice has had more negative impacts on the people of Iceland than all the volcanic eruptions, earthquakes and other disasters put together since the island was first settled in the late 9th century. As a landscape feature it is deeply engrained in the national psyche. In the year 1881, possibly one of the coldest years in Iceland in the recent past, an Icelandic poet, Matthías Jochumsson (1835-1920) composed a poem called Hafísinn (“The Sea Ice”). At the time he was living in Akureyri in the north. The town is situated at the end of a long fjord, Eyjafjord. It is said that he was inspired to write the poem as he saw the ice gliding into the fjord. Using telling language and chilling metaphors through eight ten-line stanzas he describes the horror and misery that sea ice can bring. An example is the term landsins fjorni fjandi, meaning “the country’s ancient enemy”. This is a phrase that has come to be known by all Icelanders as a metaphor for sea ice. He also coined the evocative phrase hungurdiskar meaning “plates of hunger”. Here he is referring to pancake ice – the type of sea ice that is formed into round disks reminiscent of the shape of pancakes. The irony is clear. The word “pancake” is suggestive of appetising food, but these “plates” do not bring food, only hunger instead. 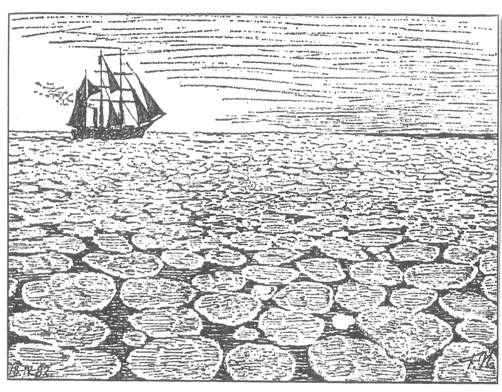 The illustration is a sketch of pancake ice by the Norwegian explorer and humanitarian, Fridtjof Nansen (1861-1930), during his first visit to the Arctic in 1881, the year Matthías Jochumsson composed Hafísinn. 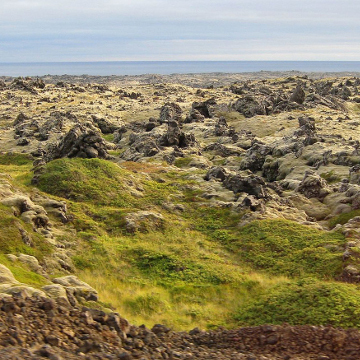 The story of how Iceland got its name is also telling with regard to the effects of sea ice. It involved an early would-be settler to the country, Floki Vilgerðarson. He reportedly spent the summer fishing and neglected to gather enough hay to feed his livestock over the winter. They died during the following harsh spring. Noting the presence of sea ice he left in disgust and returned to his homeland of Norway, having given the country the name of “Iceland”. Since the early twentieth century, sea ice has mostly been an infrequent visitor to Iceland. It will remain to be seen if this present respite will continue, or if it may one day return, under a future climatic regime. Across the Atlantic from Iceland, at the Labrador coast, now called Nunatsiavut, the current situation is very different, with loss of sea ice experienced not as a boon but as a severe hardship. In this location, sea ice and icebergs are distributed by the cold Labrador current flowing along the coast and into the North Atlantic Ocean. Nunatsiavut also has its fair share of historical documents, a legacy of the Moravian missionaries who established stations there from the late 1770s onwards. Many of these documents give a sense of sea-ice conditions in the past. The ice around the coasts used to become frozen hard in the early autumn and remain so until late spring, providing an extension to the land on which to hunt as well as a highway between communities. Now the ice has become treacherous and can no longer be trusted to provide a safe pathway. In recent times it has happened on several occasions that hunters and travellers have fallen through the ice and perished. Discussions with local informants illustrate a story which is very different to the sea-ice experience of Iceland. The death-bringing “plates of hunger” to Iceland when compacted into fast ice off Nunatsiavut provided food in the form of marine mammals. Geographer Shari Gearheard discusses Arctic environments changing as a result of a warming world and how local environmental knowledge of sea ice conditions is becoming less and less dependable. Indigenous communities that have relied on such traditional knowledge for many generations are increasingly at risk. People in local Nunatsiavut communities state that over the last 20-30 years “the winters have been different”. In past times it would usually get cold at the end of October or the beginning of November, and then there would be a steady increase in the cold. In the last 10 to 15 years “there has not even been proper freezing until January”. There has been no long steady cold that makes the ice hard. One informant noted that if you get snow on top of the ice, it acts as insulation to keep it frozen hard. This happens less now. Another informant said: “The snow is no good now – no good for making snow houses – my children and grandchildren don’t know how to do it.” Thirty years ago, people would go out to the sina, the ice edge, all the time. This has changed: “We are not seeing the heavy pack ice as before. This could stay to the first week in July. 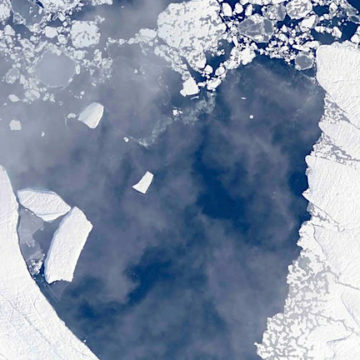 The ice used to extend for 80 to 90 miles, but not now. We used to go out on the ice for days, looking for seals. Now we don’t trust the ice anymore. People used to be able to look at the ice and see if it was safe to walk on. 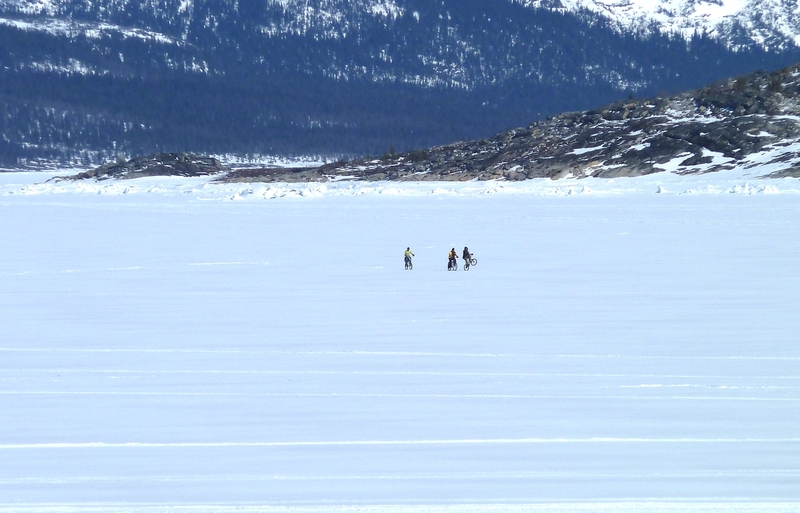 Sometimes people take chances.” One Inuit elder stated: “if the ice is treacherous, just walk lightly”. Perhaps the last word should be given to one of these informants: “If people in the south don’t believe in global warming, just tell them to come up here and talk to us”. The sea ice cap changes minimum summertime extent, which typically occurs in September, has been decreasing for decades at a rapid pace. Discussing the archaeological site of Gufuskálar on the northern tip of Snæfellsnes peninsula in Iceland.